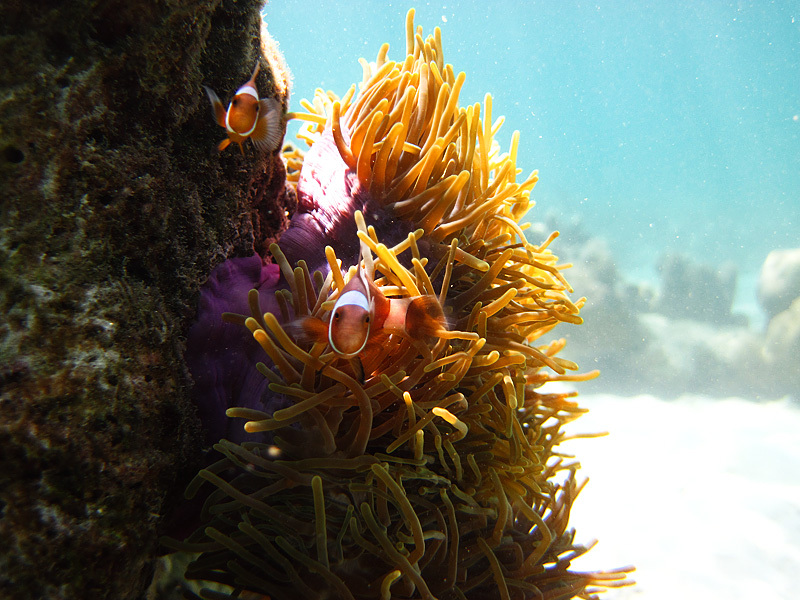 Clown fish swim among the tentacles of a sea anemone in the crystal clear waters off Ko Lipe. First and foremost, I must give credit to the photographer, Marco. I don't snorkel or dive much anymore so an underwater housing is a completely unjustifiable purchase for me. On the other hand, Marco seems to spend more time with a fin and goggles on than actually walking on solid ground therefore it's fitting that he owns a small underwater point and shoot Canon camera. These photos are published with his permission. As evident, the waters around Ko Lipe are crystal clear and teeming with an abundance of tropical sea life. I'm told by dive outfits the world over that nothing did more for diving and snorkeling than the Disney movie "Finding Nemo". Clown fish are now some of the most recognizable marine life in the tropics but please, by the beard of Zeus, do not call them 'Nemo'. It's as ridiculous as calling all deer, 'Bambi' or all dark hair Italian action heroes, 'Rambo'. Clown fish stare at the snorkeling cameraman in the waters of Ko Lipe. 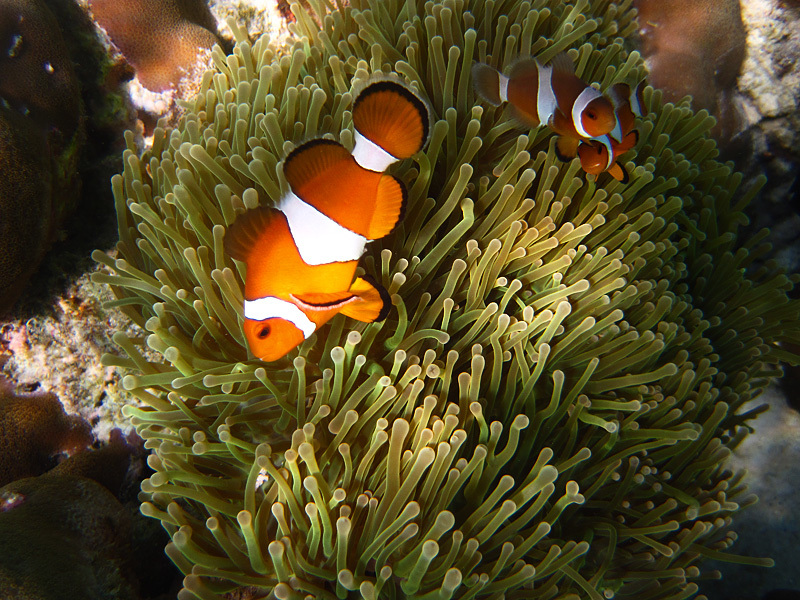 These clown fish are inquisitive little guys. They're as curious about you as you are of them. And why wouldn't they be? What if an oversized shirtless creature came to our home and lazily gawked at us going about our daily lives? Surely I'd look out my window and stare at the intruder for a bit. Maybe even throw a sharp object or two at the peeping tom.